The Austrian Court and Russian Army were retreating there after Napoleon’s success at Ulm on the Danube. They were pulling back from Brunn, modern day Bruno, which (no caleche for me) was the airport I used to visit the city, about 80 miles up the motorway. The second prompt to Olomouc, as it is known today, was the revival of Peter Shaffer’s play Amadeus at the National Theatre in London (October 2016). I knew about the genius of Mozart, but it was not properly defined for me until I saw Simon Callow play the title part against the mediocrity Salieri (Paul Schofield) in 1980. Mozart died young, but not before making his genius soaringly clear. Yet, living in such medically-perilous times, what if he had died younger? We would have had other musical titans to extol – Bach, Beethoven, Schubert, and many might add Lennon and McCartney, Bob Dylan and Bowie. But Mozart towers above them all, and if he had never lived, or had he died at the age of 11, then I think we might have had to rein in our definition of genius, at least as far as it applies to music. So, as I walked past the National on the opening night of Amadeus, I thought of Olomouc, the place where Mozart did not die of smallpox in November 1767. The composer was only starting his career when his father took him and his sister there to escape the epidemic raging in Vienna. He caught smallpox anyway, but, obviously, survived. The family stayed for six weeks, first in the then Black Eagle Inn (today the Hauenschild’s Palace); then the deanery (now the Archdiocesan Museum, which tells the city’s 1000 year story) where I slid in special protective shoes over the same polished floorboards the child prodigy knew. While convalescing he completed his Sixth Symphony, giving the premiere on his way home in Brno. Another musical genius, Gustav Mahler, was in Olomouc a century later, in 1883, working at what is now the Moravian Theatre. Among the new operas he opened there was Bizet’s Carmen. Mahler stayed where Café Destiny is today. This small Moravian city boasts high elegance, deep history and architectural treasures to match Prague’s (two hours by road and rail), but without the crowds. It has palaces, fine old churches and townhouses. There is a smelly local cheese and a very political clock. On my visit, just as the Christmas market was opening last November, it was very wise to go on the first morning to the top of the 240 feet high tower rising out of the C15th Town Hall, for an overview of the historic houses and opulent palaces lining the Upper Square and adjoining streets. Higher still is the tower of St Wenceslas’ Cathedral. On view from on high is the city’s fabric, rich in superlatives – sumptuously decorated facades, powerful perimeter walls, rare Romanesque windows and random wonders. The Church of St. Maurice, for example, has a unique double spiral staircase and the largest organ in Central Europe. 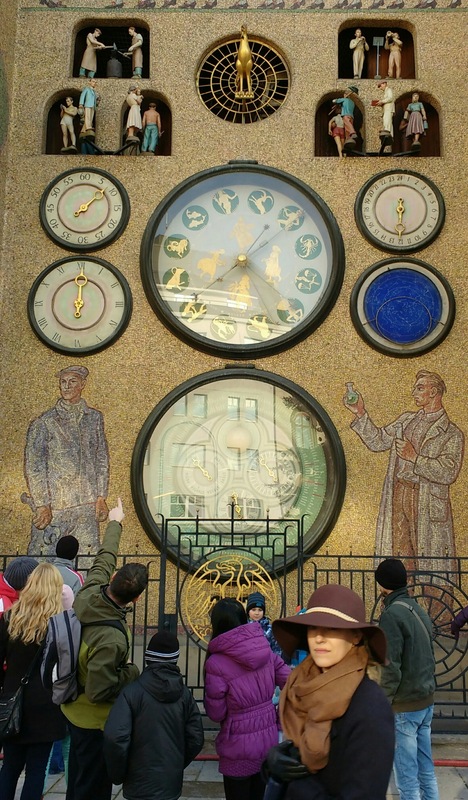 Prague has a well-know, crowd-drawing clock. 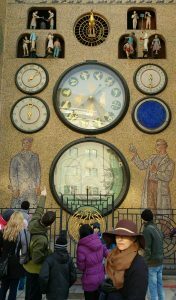 Olomouc’s Astronomical Clock, which dates from 1422, only 10 years after its sister in Prague, is twice as curious. For the first 500 years the same parade of religious and royal figures sounded the hours here. Then German troops wrecked it, in 1945. The Communist regime gave it the full socialist realism restoration. Mosaics depict the appropriate toil for each month. At the strike of noon, model factory workers, farmers, athletes and labourers judder out to hammer out the chimes, while a car mechanic and a scientist look on. It was such an unusual tourist attraction, the city decided not to change it when the peoples’ state fell in 1989. But unlike Prague’s clock this one only “performs” at midday. The city’s unmissable Baroque marvel is the 100 feet high Holy Trinity Column in the city centre, decorated with many stately religious sculptures in a mix of stone and gilded copper. It was the culmination of a century of monument building in Central European city squares. UNESCO believes it has no equal in Europe. The best examples of the city’s own take on the ornate and lavish Baroque style, which launched the city’s golden architecture age in the 1600s, are the Hradisko Monastery and the Archbishop’s Palace and many fine churches – my favourite is the Church of the Virgin Mary of the Snow. Napoleon come close to Olomouc, but left no mark. I would love to think that Julius Caesar actually visited the bend in the river Morava, the site of today’s city, to justify the suitably grandiose statue of him in the Caesar Fountain. It is the largest and technically skilled of the six Baroque fountains, which enhance the city centre. The legendary founder’s pose, astride a rearing horse, is based on a sculpture of Emperor Constantine in the Vatican. Now there is firm basis for the folk memory that the Romans were here once. In 2001 archaeologists found the remains of a Roman camp, built 200 years after Caesar. It was conclusive proof of the Romans’ deepest incursion into Central Europe, 150 miles north of the Danube. Olomouc does not have an airport, but there are flights from the UK to Brno, 80 minutes down the motorway (£30 – 40 in a taxi).